One of them is ‘Ekaterina’, the famous Russian historical TV series that has been airing since 2014. Also called ‘Ekaterina: The Rise of Catherine the Great’, this series is inspired from Russian history, particularly about Catherine the Great, one of the most well-known Russian empresses and her life story, even having her own castle with magnificent architecture! 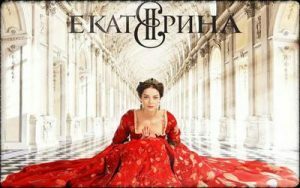 There are a lot of reasons that you need to add this to your watch-list, so let’s just talk about these 5 reasons to watch “Ekaterina”, the Russian historical TV series! First things first—it is a Russian historical series anyway, so it’s great for adding your knowledge about Russian history. If you find it hard to learn through books or documentaries, why not learn from this one? Of course it won’t give 100% complete information about Catherine the Great, the great empress who initiated the Golden Age of Russia at that time, but at least you can feel immersed in the 1700s Russian era and understand the motives and conflicts that arise there during that time. Some reviewers have even stated that it’s the best and most accurate historical portrayal about Catherine the Great on TV, so it’s like a history lesson wrapped in an epic series! If you’re a fan of Russian history, go ahead and also check out these best Russian historical movies. The word ‘history’ might be boring and uninteresting to some people, but Ekaterina has a way of presenting history in a way that can lure audience to keep watching, even those who don’t like history. In short, it’s about a German-born princess Sophie Friederike Auguste von Anhalt-Zerbst-Dornburg who was appointed to marry the nephew of Russia’s then-Empress Elizabeth, although she was a foreigner. Calling herself Catherine Alexeevna or Ekaterina, Catherine slowly learned the dark plots of the Russian Imperial court and unsettling plans of the monarch, leading her to save herself and become a great heroine for herself and her children. Moreover, the series is also filled with suspense, because it’s full of backstabs and unexpected twists. You will most likely be surprised at the twist and turn of every episode because of how corrupt and sly the monarch is. So even if you don’t like history, you’ll most likely be hooked watching the struggles of Catherine trying not to subdue to the corrupt Russian politics in her time. This series has received lots of praises for its cast lineup along with strong production team. Marina Aleksandrova has really done an outstanding job portraying the complex character of Catherine the Great. You will also be compelled watching the great dynamic between Catherine and the equally powerful female character, Empress Yelizabeta, who is a fearless, fierce and headstrong leader who chose Catherine to marry her nephew in the first place. At the same time, audience will also sympathize with Catherine, who is forcefully wed to a husband who does not even love her and even has affairs regularly with other women. Viewers will see how Catherine slowly evolves from an unhappy, humiliated wife to a strong, wise, and charming leader. Aside from the acting, the production is also first-class, with particular highlight on a great setting, visuals, and costume design team. The series itself was shot in Russia so viewers can get an authentic feel of the Russian empire. This has led the series to win Russia’s Golden Eagle Award as best television series in its first season! Reviewers have put special emphasis on the vivid and beautifully made plot, costumes, and thrilling music. Another reviewer from Broadway World praised how the series is a balanced mix of drama, politics, betrayal, and history all at the same time. The series has received well reviews for the moral lesson that it brings. It is compared to other Western-style series that usually have little positive moral we can learn from. Reviewers have praised it for having good moral and philosophical content, especially related to love, family, and empowerment of a strong female character! It is also not as morbid, vulgar and graphic as other monarchy TV series you may find. The best part about watching TV series from another country is getting new knowledge about the origin country’s language and culture! If you’re looking to improve your Russian by watching TV, you can look to this series to start. Don’t worry, although the setting of this series is in the historical ages, you can still follow the conversation along. Just don’t forget to use subtitles to help you! Also, this series has occasional narration to help audiences understand the plot better, explaining historical events which may not be familiar to general audience at first. It’s very useful to help you understanding the plot especially if you don’t have background knowledge on Russian history to begin with. Also, pretty sure you will learn many new vocabulary related to monarchy and politics, a great addition to your Russian word bank. So, those are the 5 reasons to watch “Ekaterina”, the Russian historical TV series! Even though you don’t know much about Russian history, or perhaps aren’t a fan of history yourself, this series is still filled with great acting, suspenseful plot, unexpected twists, and awesome visuals and music that is just will leave you amazed. If you’re a fan of kingdom-related shows, you’ll particularly love this one! Not to forget, it’s an effortless way to improve your Russian language and general knowledge. Meanwhile, also check out these self-study principles to learn Russian language.